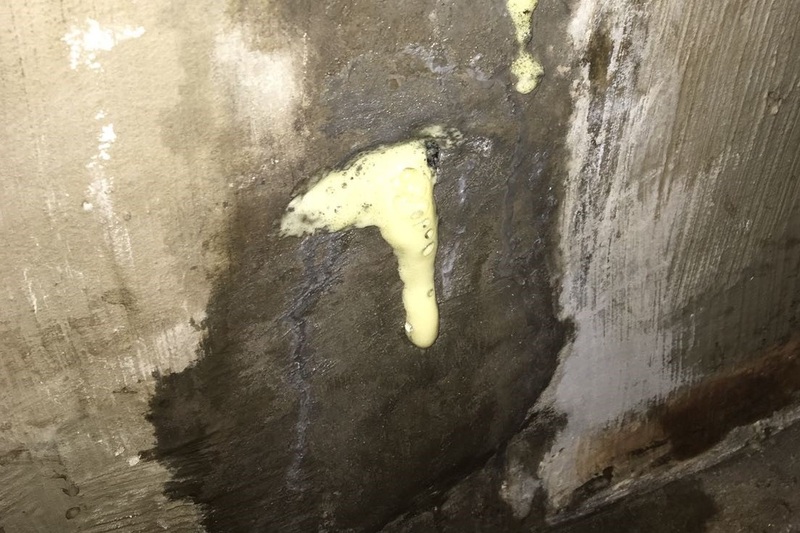 CSC Services have for many years been leaders in injection resin leak sealing solutions across the UK, working with water and power companies such as EDF Energy. Leaks can appear in reinforced concrete through carbonation, causing steel to rust and expand, which inevitably cracks the concrete encasing it. Other reasons might be movement or poor construction. The polyurethane based injection resins we use are very fast acting on contact with water and can halt the flow of water quickly. This, coupled with a repair of the crack and possible waterproofing of the structure with one of our many systems, can prevent future leaks. Epoxy Injection resin can be used as a structural repair to cracks in concrete. This system restores the original strength to the concrete and seals in the reinforcing – preventing further damage from moisture. Resin injection was used during a scheme of work to waterproof a machine pit at the Komatsu manufacturing plant which is shown in the image. Resin Injection was used to repair a structural leakage problem at a water treatment plant of a Quarry site. More about this work here. Ingress of water around the floor joints of the rail offloader area at Lynemouth Power Station was eliminated by Resin Injection. You can read more about this project for client Sir Robert McAlpine here. Overbanding and resin injection were used to waterproof a basement structure in Newcastle, as shown in film above. More about this work here.